A decade after the World Trade Center disaster, rampant speculation abounds on what actually happened. Wild talk flourishes on the Internet, TV, and radio. Was the Pentagon really struck by a missile? Was the untimely death of Barry Jennings, who witnessed the collapse of Tower 7 and thought he heard “explosions,” actually an assassination ? Not everyone is convinced the truth is out there. 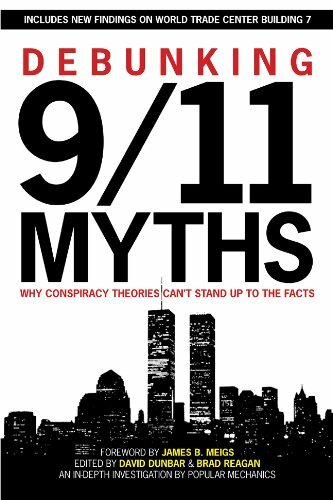 Once again, in this updated edition of the critically acclaimed Debunking 9/11 Myths, Popular Mechanics counters the conspiracy theorists with a dose of hard, cold facts. The magazine consulted more than 300 experts in fields like air traffic control, aviation, civil engineering, fire fighting, and metallurgy, and then rigorously, meticulously, and scientifically analyzed the 25 most persistent 9/11 conspiracy theories. Each one was conclusively refuted with facts, not politics and rumors, including five new myths involving the collapse of 7 World Trade Center and four longstanding conjectures now considered in the context of new research. David Dunbar is executive editor of POPULAR MECHANICS and led the editorial team that produced the groundbreaking cover story debunking the conspiracy theories surrounding 9/11. He has also directed the magazine’s coverage of the war in Iraq and Hurricane Katrina. Brad Reagan is a contributing editor to POPULAR MECHANICS and has reported for the magazine on digital forensics and on the counterterrorism programs of the New York Police Department and other law enforcement agencies. He was previously a staff writer for The Wall Street Journal. Popular Mechanics is read by 9.6 million people every month. With more than 100 years of expertise in covering science and technology, the magazine is ideally equipped to confront the rumors surrounding 9/11 and explore the evidence with scientific facts.